Pieris (Pieris spp. ): growing, planting, caring. The Pieris or Andromeda is a small shrub packed with qualities: a pretty foliage and a flowering in white seductive bells. Scientific name : Pieris spp. Pieris - andromedas or fetterbushes - is a genus of seven species of shrubs in the family Ericaceae, native to mountain regions of eastern and southern Asia, eastern North America and Cuba. They are broad-leaved evergreen shrubs growing to 1–6 metres (3 ft 3 in–19 ft 8 in) tall and 3–10 ft (0.9–3.0 m) wide. The leaves are spirally arranged, often appearing to be in whorls at the end of each shoot with bare stretches of shoot below - they are lanceolate-ovate, leathery textured, and with an entire or serrated margin. The young leaves in spring are typically brightly coloured. The flowers are bell-shaped, white or pink, and arranged in racemes. The fruit is a woody capsule which splits into five sections to release the numerous small seeds. Pieris are popular in urban areas for their evergreen foliage and ease of maintenance. The pieris represent seven species of shrubs of Asian or American origin very popular in urban areas, because they support the semi-shade, have persistent foliage, and can grow in big pot. According to the varieties they measure between 0.5 and 5 meters, with a broad and ramified habit. Their foliage is evergreen, alternating or whorled, and leaves are crenate, oval, dark green lustered. Juvenile leaves are often red, pink or white. In spring the end of the branches is adorned with clusters of white bells. These look like heather flowers - which is from the same family. Before hatching, these flowers form purple or pink clusters. 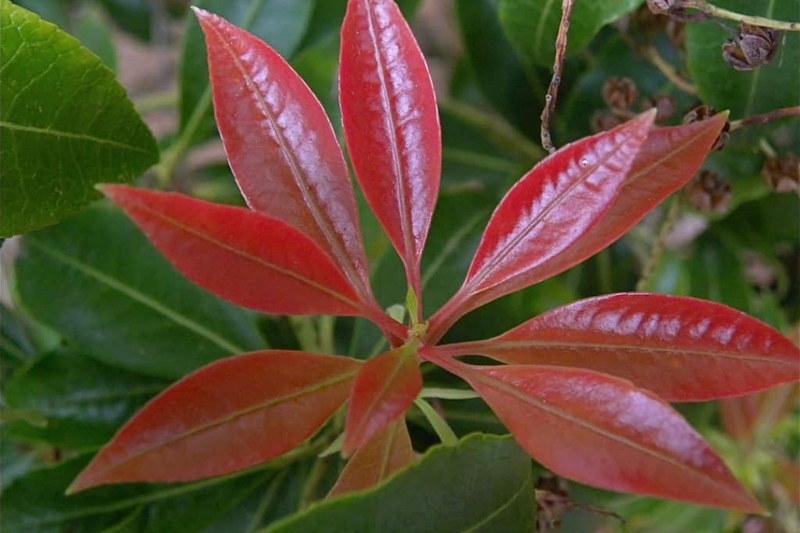 Pieris is a heathsoil plant - it likes rather acidic, rich and well-drained soils! But do not panic if your soil is rather limestone: amendments, or just a pot culture will allow you to enjoy this beautiful plant. Plant it in April or early fall. The pieris enjoys a semi-shaded or sunny exposure. In addition, it resists rather well to the cold of winter. It can be planted as a group, as a massif, as a hedge or as a border. It will also be enjoyed in pots, on the terrace or on a balcony. Remove it from its pot. Gently detach the roots from each other, making sure they do not cross each other. Put the root ball in a bucket of water to rehydrate the plant. Make a large hole - about half a meter to one side, then crumble the soil that you removed and mix it with heathsoil - about 1/3 of earth for 2/3 of heathsoil. You can also bring some sand and potting soil if you have some! Arrange your plant in the middle of the hole taking care to spread the roots on the bottom. If your soil is too calcareous, you can put a gardening geotextile at the bottom of the hole to create a kind of heathland soil pocket. Then fill the hole with the mix, slightly tamp the ground, then water abundantly! The pieris main demand is water! The soil must stay cool, even during summer. Thus, it must be generously watered regularly with softened water. At the end of summer, you can space out the waterings. Be particularly attentive to potted azaleas: the surface dries faster, and the plant has very little reserves: a dry bout will be deadly! One thing: you should form a hollow at the base of the shrubs and then spread out a 10 cm thick layer of mulch. In the spring, water in the morning, and in the summer, in the evening after the sun has set. If you can, avoid hard water! An easy solution is to collect rain water... If in doubt, add fertilizer for heather from time to time to help solve the problem. For a beautiful bloom, plan to bring in spring and autumn fertilizer for heathland plants, both in open soil and in pots; you can also add decomposed manure in the spring, and spread it at the base of the plants. Your pieris, if it is in pot, will appreciate new shoes, every 3 or 4 years! Repot at the end of winter. Take out the root ball by tapping the edge of it. Lay the mound on the side, then with a sharp knife cut the lower third of the root ball: the root system is thin and dense and it is easy to reduce its size. Then remove a crown of roots and soil on the perimeter. You will have reduced the rootball by about half. Place a layer of gravel at the bottom of the pot for drainage, and repot in a mixture of earth and heathsoil with a little sand. Finally, tamp and water copiously. A few days later, you can do a light thinning pruning. To prolong the flowering, you can cut the withering flowers! Take the time to remove dead wood and damaged or badly placed branches.